How sure are we that Super Joints (DVD) will work for you? 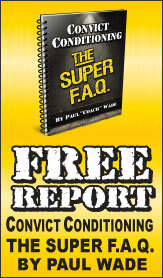 Simply fill out the form below and put Super Joints (DVD) to work for you right now. Obviously, we would go out of business if Super Joints (DVD) didn't work, the way we said, right? With the promise of a full refund if you're unsatisfied, you have nothing to lose by trying Super Joints (DVD). Go ahead and try it today. Jump-into-Action Workout for High Performance and Longer Life"
"Injuries Flee the Scene of the Crime, Rehab Miracles Become Norm—Using Super Joints Fast Response, Rescue-Your-Own Body, Super-Relief Program"
You have a choice in life. You can sputter and stumble and creak your way along in a process of painful, slow decline—or you can take charge of your health and become a human dynamo. And there is no better way to insure a long, pain-free life than performing the right daily combination of joint mobility and strength-flexibility exercises. In his Super Joints workout, Russian fitness expert Pavel Tsatsouline shows you exactly how to quickly achieve and maintain peak joint health—and then use it to improve every aspect of your physical performance. Only the foolish would deliberately ignore the twenty-nine life-enhancing techniques Pavel demonstrates in Super Joints. Why would anyone willingly subject themselves to a life of increasing pain, degeneration and decrepitude? But for an athlete, a dancer, a martial artist or any serious performer, Super Joints could spell the difference between greatness and mediocrity. The "Super Joints" by Pavel Tsatsouline was excellent. After 30 years of practicing and teaching martial arts (Uechi/Shohei Ryu, and Ju Jitsu), and the natural "break down" of the joints with age, the "Super Joints" has helped to restore the flexibility and strength of my joints especially an arthritic shoulder. I have incorporated the "Super Joints" into my Russian kettlebell and functional training workouts. Rated 10/10 Hip Replacement Cancelled! Twice! This DVD is nothing short of incredible, remarkable or outstanding. By committing and following the program on a daily basis, and making it a lifestyle change I have done what many would consider impossible. And that is to overcome the debilitating disease of osteoarthritis, twice! It was some time ago that I first came upon this DVD because my doctor was recommending a hip replacement which I refused. I followed Pavel's DVD program and regained total mobility in months. My second go round came about as a result of a sedentary period in my life following a heart attack. Once again, following the program after regaining my heart health, I was able to reclaim my mobility. Now I'm committed to following this program as a daily lifestyle change and never having to experience old age stiffness, and disability again. Living in these times of struggle requires a warrior mentality and a proven program to keep one fit and young. By following this DVD I have been able to do just that. Good luck comrades! Rated 10/10 Lubricate you Joints... Like this... Observe... Enjoy! I enjoyed this video, as well as the other videos that Pavel presents. Although they seem short in length, Pavel shows you the essentials. Sometimes what is most important such as joint conditioning, is often the most basic in nature. Do the recommended exercises and get Pavelized!!! Thats an Order!!! And watch Rambo III. Its required viewing!!! I now stretch 3 times a week and I follow this dvd. It's perfect for martial artists who are over 30 like myself. I started Capoeira at age 31 and with all the movements we do, I needed a good stretching dvd that was modified for older joints and this is the one. At 37 years of age, my joints had already been cracking and hurting in the morning. I sustained an injury parachuting in the Air Force in 1989 and since, have had many back pains. I ordered Super Joints figuring it would be good, as all of Pavel's dvd's and books have been excellent. The first day I went through the dvd and did all the joint mobility drills. I felt better that day and over the course of the following week noticed that in the morning, my back wasn't as stiff and my elbows didn't hurt. I would highly recommend this dvd to anyone that cares about their joints. Super joints has been the perfect compliment to my kettlebell training. Residual tensions I developed over the last year of strength training have disappeared after my first day using SJ. The wind mill, and belly dancing alone were worth the price of the video. I also enjoyed the simple and precise explanations of the exercises. Pavel is truly a great fitness teacher. Rated 10/10 This DVD is the best of its kind. I have researched a lot of DVD's and the ones that keep your joints healty are few and far between. (I am a 65 year old librarian/exercise video enthusiast.) In fact, I have found only two others. I very much like the two other I found, but like Pavel's the best. It gets every joint and does it in a minimal amount of time. I am very happy I found it! Rated 9/10 Disappearnce of 25 years of shoulder impingement pain! By TooSteep / Vancouver, B.C. For 25 years, I have been unable to do any kind of chest press because of an impingement in my left shoulder, which always led to pain the day after doing any kind of pressing. 3 weeks of daily practicing of all the shoulder joint mobility drills in Super Joints (along with careful observation of 'healthy shoulder' pressing techniques learned on the DragonDoor fitness forum) ... and I was able to bench 5X5 55lb dumbbells last week totally pain free! Pain free after 25 years is truly great stuff. I'd love to achieve the same type of hip mobility improvements.